Current Market Analysis: New Jersey has a large and often wealthy population. This is good news if you are looking to sell a national bank note from an old New Jersey bank. The location of the town matters a lot. There are significant premiums for notes from shore banks. Towns that are typically considered part of the New York City metro area tend to be popular. Bank notes from other places in New Jersey can struggle to find support once more than three or four are known to exist. The type of note issued is also important. First charters are traditionally fairly scarce. High grade second charter notes and 1902 red seals are certainly in demand. There is even a lot of competition for truly rare 1929 notes. 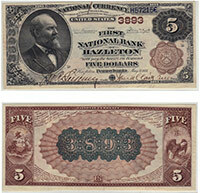 We buy all antique paper money issued by The Second National Bank of Newark, NJ. We can tell you how much your $5 bill is worth. We aren’t just dealers. We are also collectors, experts, and appraisers. We have contributed to numerous price guides and are considered specialists in the field of national currency. Contact us via phone or email to get your free appraisal today.